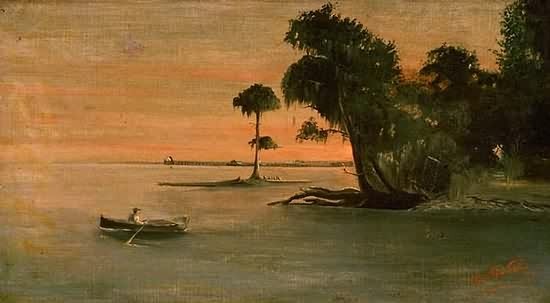 Lake Pontchartrain, Milneburg in the Distance-George Gay (c. 1858-1914) 1891 oil on canvas. Little is known of the Louisiana landscape painter, George Gay. 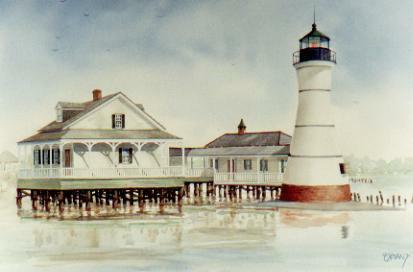 Favoring coastal scenic vistas, Gay lived and worked in New Orleans from 1884 to 1897. His primitive style reveals limited formal art training. 'WINTER IN THE SOUTH' - Article from HARPER?S NEW MONTLY MAGAZINE, December 1858. 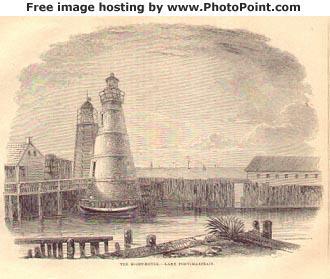 Woodcut engraving 'The Light-House?Lake Pontchartrain'.